Paper birches are the white birch trees whose trunks absolutely glow in the sunlight. I found this clump of trees on a walk through the woods last summer. I love birches, and you know, it is about worth it to live where the winters are so cold since it means these trees can grow well here. 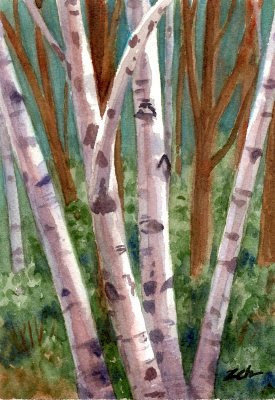 They are fun to paint, and I'll often include birches in my larger landscape paintings.